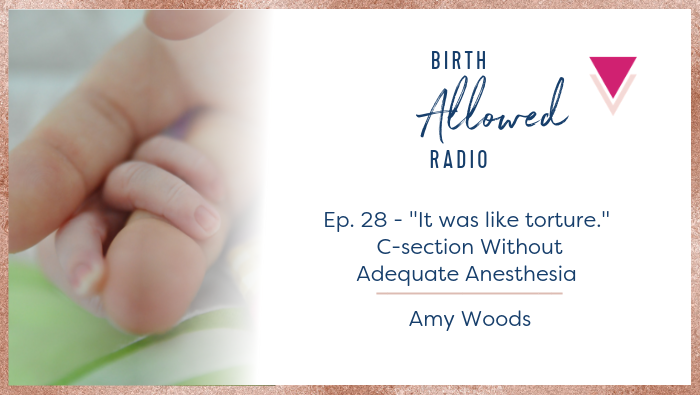 In a town with one hospital and two doctors, Amy Woods describes her labor and subsequent surgery without pain medication. She also talks about the effects on her and her family afterwards and the hospital’s response to the incident. “The doctor said I had to have a c-section because I wasn’t progressing. They were kind of, a little messy with the reasons for the c-section. As they were taking my husband to get him all dressed for the c-section, I just remember having the most distinct feeling that I needed to tell him how much I loved him. And that–I was going to die. I thought the safer option for [my baby] was the c-section. Then the OB came in and she did her poke test on my stomach and I told her that I could still feel all of it, that I had feelings in my legs. I could feel everything. And she just started cutting. And she just started going on with the surgery.